Captain Bernard Peter de Neumann, G.M. Peter (as he was invariably known) was born in Eva Cottage, Leigh Road (now London Road), Hadleigh on 18th September 1917. He was the youngest of four children (the others being Derrick, born 1908, Basil, born 1910, and Olive, born 1915). In common with many of the children of Hadleigh, he, and his brothers and sister, spent their early childhood exploring Hadleigh Woods, Hadleigh Castle, Adder Hill, Thundersley Downs, Benfleet Creek, Two Tree Island, and the many creeks, mud-flats and sandbanks in the vicinity. In Hadleigh he was a member of a large extended family with many cousins - in those days many of the families were related through the Potter, Heathcote, Iredale, and Choppin families. His maternal grandfather was George Weyland Potter of Hadleigh Hall, who owned and ran a grocery store and the local post office. He began his education under the stern, but knowledgeable Mr Tutt in Hadleigh School, and later attended Benfleet School, the Training Ship Exmouth off Grays, and the Sir John Cass College, London. When his mother became seriously ill and hospitalised, his life became almost Dickensian: To say that his early life became tough is a great understatement. His father had been drowned when his ketch, the Deerhound was lost in a storm near Broadstairs, Kent in October 1920. From then until 1926 he lived with his increasingly disabled mother. She was admitted to Rochford Hospital in early 1926, and Peter and Olive taken into the care of relatives. In December 1926 his mother died, when he was eight years of age, and he and his sister Olive were placed under the care of the local "Rochford Hundred Board of Guardians". Derrick, his eldest brother, was at sea as an officer-cadet at the time, but when he got home, from Australia, he managed to get his brother and sister out of institutionalised care and fostered out, but still under the overall care of the Board of Guardians. Olive and Peter were always fostered together, and were fostered with several families from Hadleigh, Benfleet, Southend, and Leigh, where they usually were made to feel that they were outsiders. When he was old enough the Board of Guardians enrolled him for an education aboard the TS Exmouth (Grays, Essex) - a sea training school. In those days preparing orphaned boys for a career at sea was common practice, especially as such work was "all found". He left school and went to sea in 1934, when he was sixteen and was indentured to shipping company Capper, Alexander, and, as is the practice, studied for his Board of Trade Examinations whilst at sea. Olive became a student nurse at Southend Hospital and won the Gold Medal for her year (1936?). 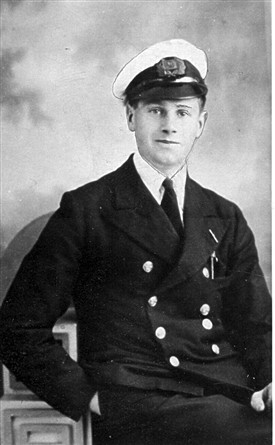 Peter became a successful seaman officer, and had become Second Officer before the outbreak of the Second World War. During 1939 to early 1941 he made many hazardous voyages to such places as the USA, Argentina and Uruguay. [The huge sacrifice made by merchant seamen during the wars of the twentieth century is not generally known to the public, and this is partially exemplified by little known fact that the merchant navy sustained a heavier rate of loss of personnel than any of the armed services.] On 1 March 1941, whilst his ship was off Aberdeen in convoy, it came under attack by three German bombers. His ship shot one down, but was struck by a 550lb bomb that penetrated deep into the engine-room, but did not explode. With the ship's engine running beneath them, Peter and the Second Engineer manoeuvred the bomb up to the boat deck, a vertical lift of more than forty feet, and then over the side where it exploded. For this exceptionally brave deed, each were awarded George Medals. He was also awarded Lloyd's War Medal for Bravery at Sea. The ship continued the voyage to Argentina and Uruguay, but the ship was torpedoed and sunk on the return leg on 21 May 1941, in mid Atlantic about 800 miles from land. Peter got his boat away safely, but the other boat had great trouble in the launch. Those in Peter's boat were rescued by an American ship after six days adrift under the unrelenting glare of the tropical sun. They were later transferred to an Armed Merchant Cruiser and spent some time searching for German raiders, before arriving in Freetown on 17 June 1941. Peter, who was due home to be married, immediately volunteered to sail in a Royal Navy prize ship, captured from the Vichy French. She sailed on 19 June 1941, but was stopped and sunk by two Vichy French warships on 21 June 1941. The survivors were taken ashore to a concentration camp in Conakry and subjected to a Vichy French naval court martial. The executive officers were found guilty of "piracy on the high seas", and they were then placed in lorries and driven into the jungle. They all thought they were about to be shot, but the journey continued overland for five days, until they reached the banks of a river that turned out to be the Niger. Here they were placed in a barge lashed to the side of a stern-wheel paddle steamer, and were then towed down the river for five days, until they arrived at Kabara. Here they were disembarked and forced to march into the desert at gunpoint. After several hours they arrived on the outskirts of the legendary, and dusty, city of Timbuctoo. Conditions were even worse than those at Conakry, and they were eventually held there for almost a year. They were then moved to a camp at Kankan, and released following the fall of North Africa to the Allies in December 1942. Escapes were made from all three locations, but white men in those regions were easily spotted, especially with the price they carried on their heads, and so each escape was ultimately unsuccessful. In one such escape from Timbuctoo, they walked 400 miles along the Niger before they were caught. Peter arrived at Greenock in mid January 1943, proceeded to his home, and he received his George Medal from the King on 11 February at Buckingham Palace. The King, who obviously had been briefed about the extreme delay in Peter's investiture, said when they met "Ah you're the man from Timbuctoo". The story appeared under the headline "The Man From Timbuctoo" in the Daily Express the next day, and the title stuck. Two days later he married Dorothy Eva Kimber [daughter of Horace Kimber, OBE, Chief of Investigation Branch, HM Customs and Excise] in Thundersley, and they eventually had two sons, Bernard and John. At this time he was also made an Honorary Member of the Royal Society of St George He gained his Master's Certificate (Foreign Going - Steamship) in 1945, despite the deleterious effects on his study of his sojourn as a prisoner. After a variety of sea-going commands he finally became Commander of His Majesty's Revenue Cruiser (HMRC) Vigilant before joining the Port of London Authority in 1953. During his time on Vigilant, which was based in Gravesend Reach, he became an early member of the Royal Institute of Navigation. During1950 to 1953 as a result of various disasters in the Thames, and the consequences of the 1953 floods, he conceived the ideas that led to the (then) highly novel Thames Navigation Service (now VTS (Vessel Traffic Services), London); he was also credited with the idea of a special navigation light for use on surfaced submarines, called the Truculent light after the disastrous sinking of HMS Truculent in the Thames Estuary. In his spare time he was a successful horticulturist and won many prizes and medals, particularly for roses, delphinia, and parsnips. He was particularly fond of the countryside and wildlife, and was an early (before it was fashionable) conservationist and environmentalist. He loved to walk in the countryside and enjoy the flora and fauna, and to practice ornithology, a habit that stemmed from his childhood, and the need for Olive and he to "escape" from their foster homes. He also was keen on budding and grafting various rootstock, especially roses, which he gathered from waste-land and thereby saved them from the pernicious attentions of potential land developers. He also kept several colonies of bees for many years. In his youth he had been a keen football player and cricketer, and in later life, if he had the time, he liked nothing better than to sit back and enjoy a good game. He was very healthy, fit and active throughout his life, and worked hard to regain his health and fitness after his imprisonment, and again after contracting tuberculosis and undergoing major surgery. He regarded his fitness as being paramount, and kept fit by tending his garden. He was very kind and considerate to others, and would always volunteer his services without hesitation - in this way he came to assist many neighbours and friends in various ways: This may well reflect his childhood experiences, and his unpleasant experiences during the war. His simple philosophy of life was based upon the idea: if it is possible for someone to do something then it is possible for anyone else to do it also. This applied, he felt, especially to himself and his family. This is in line with the training of Master Mariners, but also made him in some ways the impractical practical man. In order to introduce his particular point into a sometimes complex discussion he would begin with the words "I may only be a simple sailor but.........", and then bring the discussion back to reality. He was also mindful of the future and foresaw many of the potential developments which would come to preoccupy modern society. His role as Dockmaster involved him in dealing with many port authorities, and with large numbers of foreign shipmasters. This required a good deal of patience, understanding, and unflappability. In this he was supreme and it was said of him that he was the Port of London's finest ambassador. Regarding this a telling story was written in his obituary by Captain Bob Murray: He was very interested in natural history and often took small groups of children on country walks identifying birds, insects and woodland plants, and his knowledge was useful on at least one occasion within the docks. When I relieved him for the night watch one Saturday a few years ago, he told me that a colony of bees had swarmed inside a car parked in the dock during the afternoon. The unfortunate car owner had contacted the PLA police in desperation and, luckily, the Inspector remembered that Peter kept bees and called for assistance. He removed the swarm without turning a hair and I am sure the car owner will remember the day for a long time to come. 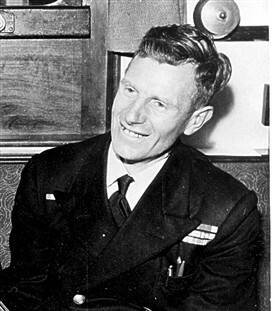 After the war he received several commendations for bravery: For his handling of the situation following the sinking of the Tug Sunfish under Tower Bridge, 12 March 1960; For his part in rescuing the crew of the Tug Kenia when she sank in the New Lock bellmouth, Tilbury Dock, 25th August 1964; For attempting to save the life of a crane driver injured when his crane toppled across the open hold of a ship in Tilbury Dock, 10th March 1966. The crane driver died before he could be released; And a few days before his death he was involved in another incident with a toppled crane at Tilbury. This time the driver survived. He was thus popular, and respected by colleagues, neighbours, friends, and family alike. He died aged 54 on 16 September 1972 as the result of an accident at Tilbury Docks. His ashes were scattered in Gravesend Reach, on the Thames, the river he knew so well. Seat and memorial garden near the Dockmaster's Office in Tilbury Dock. Memorial garden outside Bramley Court, London Road, Hadleigh. Peter de Neumann Memorial Trophy, Royal Hospital School, Holbrook, near Ipswich. A tree and mention in the Book of Remembrance, Merchant Navy Convoy, National Arboretum, Leicestershire. A seat in the ampitheatre at the National Memorial Arboretum, Alrewas, Leicestershire. "The de Neumann Way" - cycle track from Benfleet Station to Leigh Station, passing by Hadleigh Castle in Essex. This page was added by Bernard de Neumann on 20/01/2015.